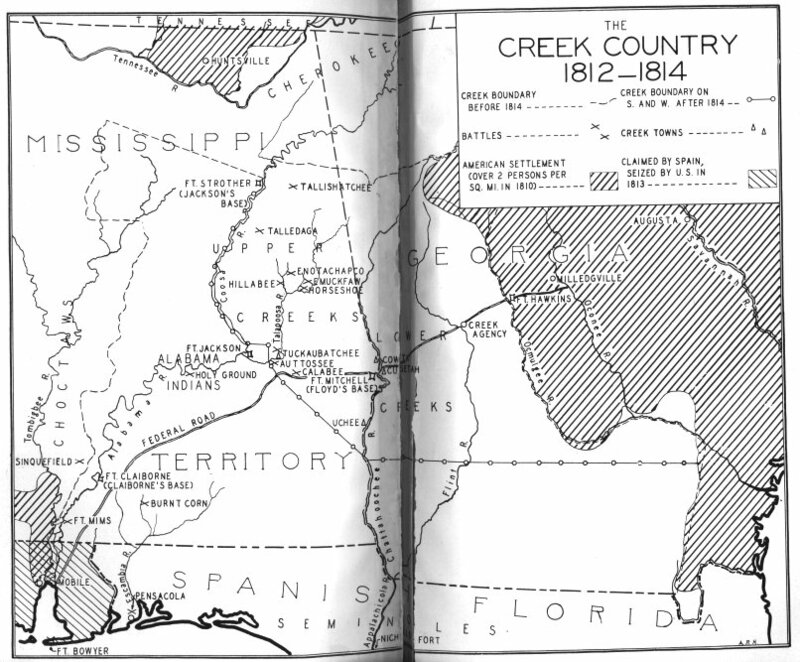 During the Creek Indian War, that had begun August 30, 1813, with the Indian attack on Fort Mims, an engagement took place between the Georgia militia, under Gen. Floyd,1 and the Creek Indians, January 27, 1814, on Calebee Creek, about 7 miles from the present town of Tuskegee, Macon County. After the battle of Autossee, November 29, 1813, and his retreat to Fort Mitchell, Gen. Floyd remained inactive about 6 weeks awaiting food and recovering from sickness. On receiving necessary supplies, and recruiting his forces, with about 1,227 men, a company of cavalry, and 400 friendly Indians, he set out on another campaign. He moved along the line of the old federal road, establishing Fort Bainbrldge in Russell, and Fort Hull in the Macon County. News was received that the Indians were fortifying themselves in large numbers at Hoithlewallee. On January 26 he encamped in a pine forest, upon the high land bordering Calebee Swamp. The hostile Indians were on the same date encamped in what was subsequently known as McGirth’s Still House branch. Here they held a council. Their numbers had increased to 1,800 warriors, probably the largest force assembled during the Creek war. Many were without guns, and were armed with war-clubs, bows and arrows. 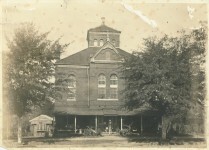 William Weatherford was present and addressed the council. 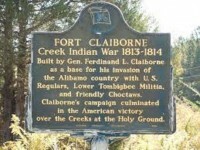 He proposed that the Indians wait until Gen. Floyd’s army had crossed Calebee Creek. Weatherford’s advice was rejected, and he left the council, and started back to Polecat Spring. About an hour and a half before daybreak on the morning of January 27, the Indians stealthily approached the camp, with Red Stick leader Paddy Welsh directing the attack. They fired upon the sentinels and made a fierce rush upon the main body. 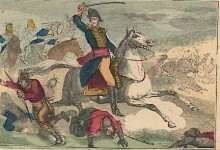 A general action immediately followed. Although surprised, Gen. Floyd’s troops were quickly organized. Floyd shouted “Cheer up boys, we will give them hell when daylight comes,” i and with the aid of the cannon repulsed them. The Indians made desperate efforts to capture the cannon, and in consequence the artillerymen suffered very severely. Ezekiel M. Attaway, one of the three men with the guns, shouted to his fellow soldiers, “We must not give up the gun, boys. Seize the first weapon you can lay your hands upon, and stick to your post until the last.”ii While the redsticks were thus bravely fighting, the friendly Indians with the exception of Capt. 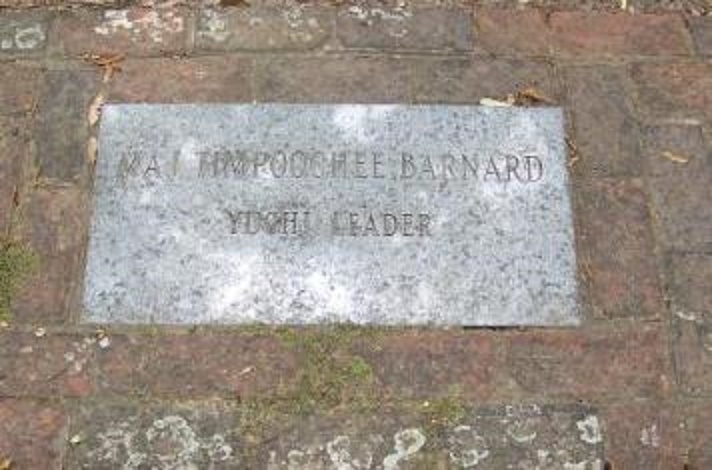 Timpochee Barnard and his Uchees, who assisted Captain John Broadnax’s picket guard, acted in a cowardly way. About daylight Gen. Floyd reorganized his lines, and ordered a general charge. The Indians gave way before the bayonet, and they were pursued through the swamp by the Captain Duke Hamilton’s cavalry, by some of the rifle companies and by some of the friendly Indians. 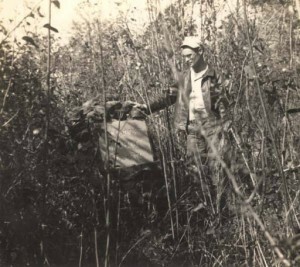 The Indian losses are not known, but 70 bodies were found upon the field, including High Head Jim, a major chief and Paddy Welsh was seriously wounded. The American loss was 17 killed, and 132 wounded. The friendly Indians lost 5 killed and 15 wounded. Captain Jett Thomas’ artillery Company fought bravely in the battle. The unexpected engagement on the Calebee thwarted Gen. Floyd’s designs against Hoithlewallee. He thereupon retreated to Fort Hull, in which he left a small garrison. He then returned to Fort Mitchell. After the withdrawal of Gen. Floyd the Creeks took possession of the battlefield. 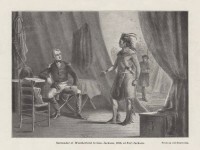 The retreat and abandonment of the campaign gave the Indians the impression that they had won the victory. The Atlanta Constitution, April 30, 1905. 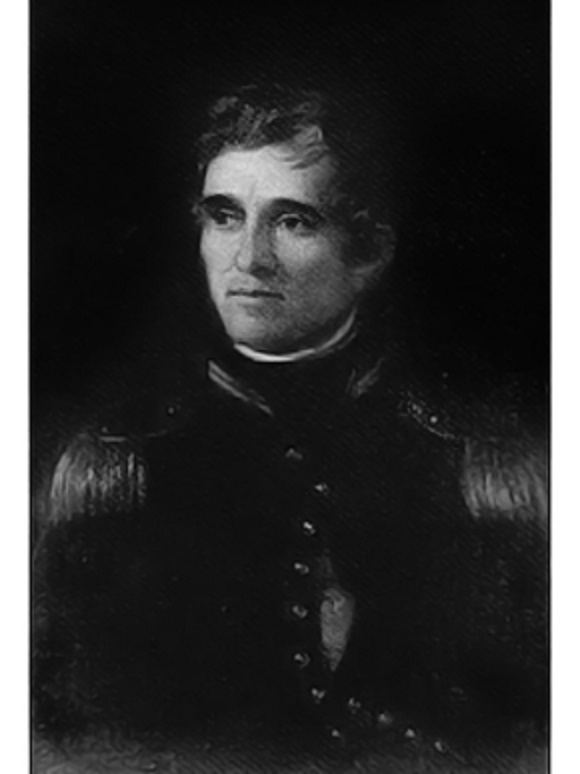 1JOHN FLOYD was born in Beaufort district, S. C., in 1769. At the age of sixteen years he was apprenticed to a carpenter. In 1791 he settled in Camden county, Georgia, where he became a boatwright. He was brigadier general of militia, and, as such, led the Georgians to Autossee and Calabee. He was in congress in 1827, and died in 1839.
iiWilliam J. Northern, ed., “Jett Thomas” in Men of Mark in Georgia (Atlanta: Ab. 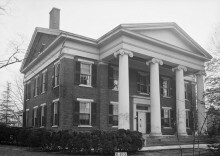 Caldwell, 1910) III, 379. Your information I find very interesting to read of the history of this Great State of Alabama, as I came from the north about 5 years ago. What is crazy is that I had future relatives fighting on bought sides. I will be buried at Calebee Cemetery along with my parents and other family. Intersection of US80 and Co. Rd. 9. I recently bought property in Macon county and believe I may be close to this battleground. Can u tell or share a map of the exact location of the Calabee Battleground? Brad, If you purchased a house from Curtis Adams on the south side of Hwy. 80, I think I know exactly where you are located and you are indeed near the battle field. The battle field was about 1/2 mile east of your property. It was near where Hwy. 49 Junc Hwy. 80 but on the north side of Hwy. 80. My name is Howard Weir. Have written book on Creek War entitled “A Paradise of Blood.” You can check it out on Amazon. A group of archeologists , Macon County officials and Al Dept Archives History have been trying to locate battle site. Can you help? Thx. I’m sorry Howard. I no longer have time to assist others in research. Good luck in finding the site. 1. 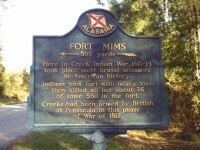 The Creek War did not begin with the attack on Ft. Mims. 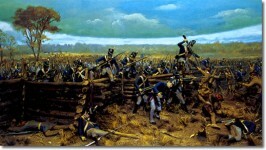 It began on July 27, 1813, with the battle of Burnt Corn Creek. 2. The story lists High Head Jim as being among 70 bodies found on the field after the battle of Calebee. High Head lived into the early 1850’s, serving as one of the commanders of friendly Creek troops during the Second Seminole War (1836-37). He died in Indian Territory, present Oklahoma. Janis, this is n interesting site. 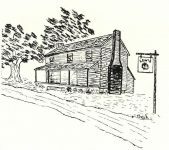 My great grandmother was Poarch Creek. Floyd County Georgia is named for General Floyd.